June 13, 2018 at 5:44p.m. Photo by The Vindicator | Now in its eighth year, the downtown Simply Slavic Festival is expanding to two days, adding a free Friday night street party that will feature a beer made just for the occasion. The main event will be Saturday from noon to past midnight on East Federal Street, Youngstown. Admission is $4. The Simply Slavic festival is catching fire. Now in its eighth year, the downtown festival is expanding to two days, adding a free Friday night street party that will feature a beer made just for the occasion. The main event will be Saturday from noon to past midnight on East Federal Street, downtown. Admission is $4. As a way to whet appetites, the street party will take place from 7 to 10 p.m. at the same site, with the tapping of Simply Slavic beer, made by Modern Methods Brewing of Warren, at 7 p.m. It will also include Slavic food trucks and music by the Chardon Polka Band. The goal is to give people a taste of the festival so they’ll return the next day. The bright centerpiece of the festival has become the vatra – a traditional bonfire that is lit after dark and that closes the event on Saturday night. Simply Slavic celebrates the Mahoning Valley’s Slavic heritage, and the vatra is a tradition in those countries of eastern Europe. Vatras are typically held to mark important dates, including – as is the case for Simply Slavic – the start of summer. 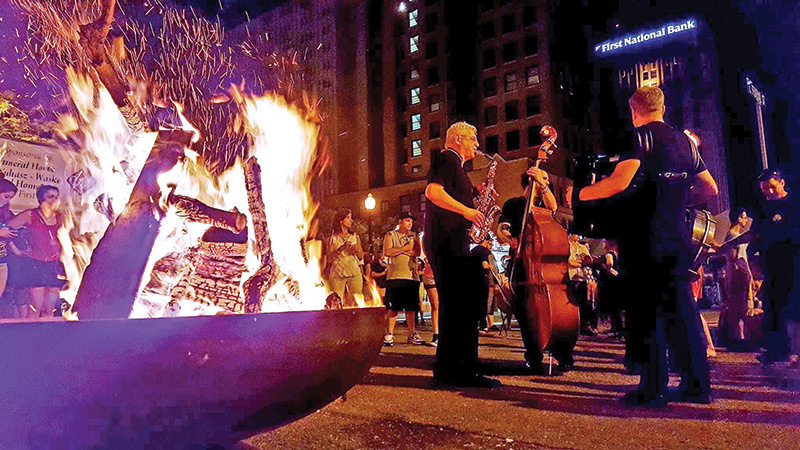 John B. Slanina, an organizer of the event, said the fire is lit in a custom-made metal firepit some time between 10 and 11 p.m.
At that time, the Slavic band Harmonia will gather around the fire to begin an acoustic set with its traditional folk instruments. The fun continues until about 1 a.m. The vatra is unique among Youngstown festivals, and is one of Slanina’s favorite parts of Simply Slavic. During the day, Simply Slavic visitors can choose from 13 authentic food vendors, a full bar, ethnic marketplace, a full day of entertainment on the stage, children’s activities, ethnic heritage tables and more. Tour buses from outside the region will bring guests to the event, said Slanina. Simply Slavic drew 4,000 people last year, said organizer Aundrea Heschmeyer. With the addition of the Friday night party, she’s hoping for 6,000 this year over both days. While the festival is all about fun and family, a secondary goal is to build pride and awareness of the Valley’s significant Slavic population. “By enhancing the community’s knowledge of these lively Slavic peoples ...we hope to honor the shared past of our ancestors and enrich the lives of the younger generation,” said Slanina. The modern-day nations representing Slavic ancestry are Belarus, Bosnia and Herzegovina, Bulgaria, Croatia, Czech Republic, Macedonia, Montenegro, Poland, Russia, Serbia, Slovakia, Slovenia and Ukraine. Many Slavic descendants of Carpatho-Rusyn heritage also reside in the Youngstown area. June 18, 2015 12:05 a.m.
June 16, 2016 12:05 a.m.
June 18, 2011 9:30 p.m.